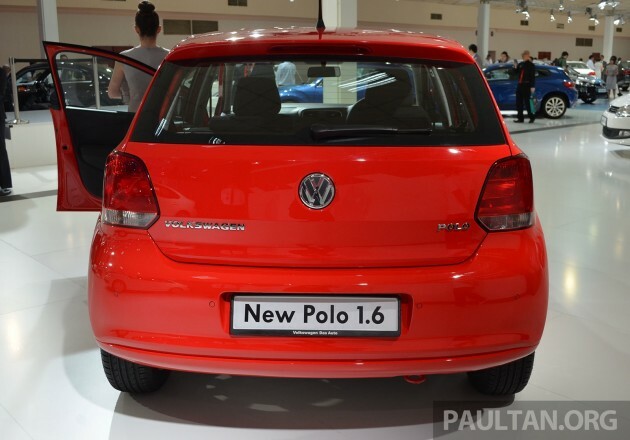 The 2014 Volkswagen Polo Hatchback is being previewed at KLIMS13. The model is locally-assembled at DRB-Hicom’s Pekan plant alongside the 2014 Volkswagen Polo Sedan that was introduced last month. VW assembly in Malaysia started with the Passat back in March 2012, making this the third VW to be CKDed. We’ve seen this one coming. Last month, an unknown variant of the Polo hatchback was spotted at JPJ Putrajaya, before reports from India confirmed the export of CKD kits from Volkswagen India to Malaysia. Dr Zeno Kerschbaumer, Volkswagen Group Malaysia’s MD, hinted as much at the recent launch of the CKD Polo Sedan. The CKD Polo hatch is powered by the same engine that moves its sedan sister, a 1.6 litre MPI engine with 105 PS at 5,250 rpm and 153 Nm at 3,800 rpm. The naturally-aspirated four-pot is mated to a six-speed torque converter automatic transmission, which has Tiptronic mode. The 1,020 kg car does 0-100 km/h in 11.1 seconds, while top speed is 184 km/h. Combined fuel consumption is 6.3 litres per 100 km. Looks wise, the CKD Polo loses the TSI’s distinctive L-shaped tail lamp elements, and the headlamp housings are silver instead of black. Like the latest Polo Sedan, there’s a ‘Volkswagen’ badge on the bottom left of the tailgate. The rear bumper shape is slightly different too, and this car has signal lamps on the fenders. The 15-inch ‘Riverside’ wheels are wrapped with 185/60 Apollo tyres from India on the show car. 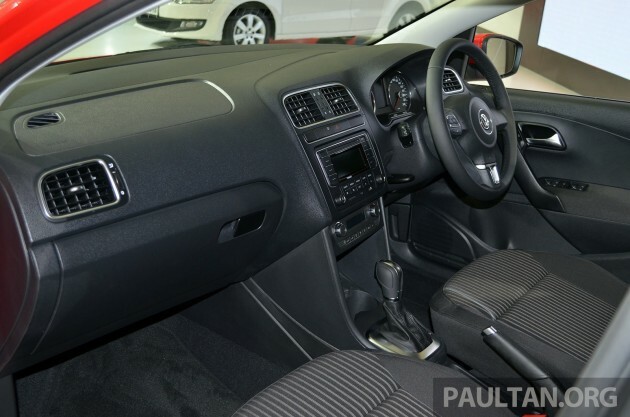 Inside, the cabin is similar to the 2014 Polo Sedan’s, with the RCD 320 radio (USB, SD Card, iPod, AUX-in, Bluetooth, four speakers) and Climatronic automatic single-zone air-con. The baby VW also has cruise control, auto up/down for all windows, leather for the steering/gear knob/hand brake lever, ‘Livon’ fabric seats, multi-function display, tilt and telescopic steering wheel and a chrome package. The latter includes chrome bits on the radio and light switch, AC panel and vents and steering wheel, among other places. Safety wise, the Polo hatch comes with dual-airbags, ABS, brake assist, ISOFIX child seat anchors and four-point rear parking sensors. Intelligent Crash Response System (ICRS) automatically unlocks your doors and turns on the hazard lights in the event of an accident. The cars shown at KLIMS13 (one red, one white) are similar to those that will go on sale in Malaysia early next year. 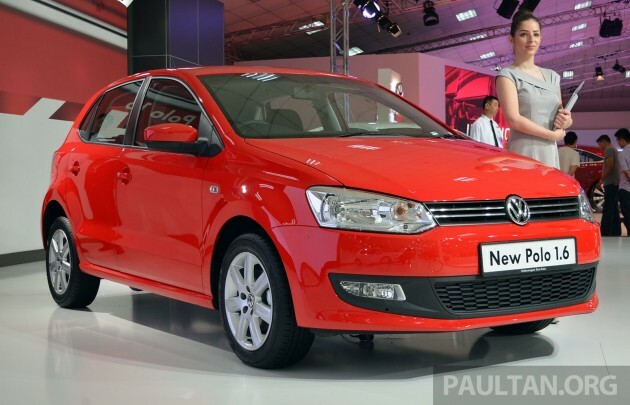 The 2014 Polo Sedan is priced at RM85,888 on-the-road without insurance, and this similarly-specced Polo hatch should be in the ballpark. How does an RM85k Polo hatch sound to you? Meh~ No power.. Cushion, no turbo, looks like Preve better~ Anytime can sapu! suprima better, got turbo and handling by lotus emblem. No VSC? Without that feature, the most important feature, its like driving a kereta mayat. Sorry lah, my family life is more important. Lagipun with all the negative feedback in their facebook page, I’d rather go for a Korean or Japanese. Got money, then buy. If no money, go back to the cheapest option available. After all it’s not bad what. When you look for value buy, then you have not enough money but pretend to be clever. When you say others are fool, you in fact is a fool also. Haha… did u ever owned a VW before? WW is for ada class dan pelajaram tinggi tinggi punya orang muda…nak safety beli hai luck atau 1 ton loli. Name only German but breakdown all the time. Pay so much but get problem after problem. Well known in auto circles that VW is one big time problematic car. RM85k? Suprima S may seem to be a better buy but at least no DSG and looks better than its sister Polo Sedan. Either way college girls love it! u must be joking right? yup.. perhaps DRB can deal with VW and take only the body minus engine and DSG.. use campro turbo and sell it for RM40K+.. The price declined from 115k to 85k, a full 30k. However the ESP was forfeited, no more side airbags, tail lamp was no longer the distinctive L shape, no TSI, no DSG, much lesser torque with higher combined fuel consumption. Personally I don’t think the 30k price declination is worth it. Anyone with me? yeah sure.. ofcoz can sapu punya maa.. when this vw polo is in parking mode that is..
Are u kidding me? Aged engine? VGM: degrading safety specs with each generation, becoming more arrogant and greedy like toyomal. Expect it to priced under 80K to compete with Jazz, but kinda expensive. It has 4 airbags but what about ESC? No ESC and 2 airbags and charged 85K? Fiesta anytime anyday. At this point, it feels like this Polo would be sold just on brand alone, nothing more. Considering the Fiesta 1.5 is cheaper, and has more stuff like keyless-GO, auto light/wiper, ESC, it seems that the Polo 1.6 would end up being a failed attempt imo by VW. No side airbags that the sedan have? i’d rather take rio than polo / fiesta. fiesta downgrade engine & airbags but price increase & no ESC/VSC. polo ckd only 2 airbags. also no ESC/VSC. rio is more value for money & loaded with full spec safety features. mind u that it will still have all the full spec safety features even it’s getting CKDed (like forte). rio 73.8k only mehh.. got 5stars ancap & 5stars euro ncap! Dude, the new fiesta got esc. Only downgrade besides the engine is airbag count, from 7 to 2. Honestly my personal choice is rio or 208 over this polo. So what happen to the ‘old’ polo? TSI and TDI are true VW DNA… Still proud of my Polo TSI.. The Polo TSI has 6 airbags. Mine hasn’t given me much problems. Could be that I always put it in N when it’s not moving (That’s what a VW salesman told me). I love the way I can sprint around other cars. But I feel that fuel consumption has gone up a bit after two software upgrades by VW SC. Hatchback is RM89k w/out insurance. It’s not bad actually but anyone looking for better tech and spec might look at the 208 or Fiesta Ecoboost. The Kia Rio and Honda Jazz is also some RM10k-RM13k cheaper. 85K for a CKD is reasonable… Tiptronic is fun.. Interval service will be 15,000km.. Naturally-aspire engine ve it’s own advantages in long run.. Lesser risk of failure.. Good choice for my 4th car. I had hoped that VW Malaysia would maintain a minimum safety standard across the line and break the mold providing stability control and six airbags for all their cars. Unfortunately they didn’t. Shame on you VW Malaysia. this car sure can sapu vios! sorry toyota can sapu VW AUDI BMW FORD PEUGEOT. I just wonder why CKD unit just can’t be CBU spec? Why must down grade the Spec?? ESC are more important than extra airbags. Pre-crash safety > Post-crash safety. A direct rival to 208 5-door selling for RM86K OTR with insurance. RM83.5K OTR without insurance. Also compete with fiesta, rio etc. 208 seems to be better equipped than this Polo. 160Nm vs. 153Nm of torque. 6 airbags vs. only 2 airbags. Since both is CKD.. price-wise, Polo should be much cheaper than 208… how about less by RM5K due to all the above? Sound fair? That’s puts it at RM81K OTR with insurance or RM78.5K OTR without insurance. But since CKD Polo Sedan goes for RM86K OTR without insurance, its quite hard to see how CKD Polo h/b could be sold for RM7.5K cheaper than the sedan. And 208 looks much better inside out, it needs a manual, 4-speed is too yesterday. For manual 208, its covered by the overpriced ckd 208 gti. Its obvious that here in Msia, any manual Peugeot = performance model. No point selling low spec Peugeot. Will only attract problem. And yes, the normal 208 should have been offered with 6-speed auto. At least that will prevent any negative perception on 4-speeder that most of us have. However, the 4-speeder auto in 208 isnt that bad.. Just.. it could be ‘better’ if it come with 6-speed gbox. Owned 208 4-speed but nothing wrong with that, feeling like normal. cruising highway at it’s best, clocked over 195km/h. If compared to this Polo and even the old Polo, 208 does better. (have experience using Golf TSI before, same handling feel). PSA is still struggling financially..
Generally Sedan Car is always CHEAPER than Hatchback model. one last thing…. quite crucial..
the 208 got traction control (a.k.a. ESP/ESC/TC) but this baby Polo don’t. Yup 208 is a way better choice. Hopefully Malaysian will realised. The 1.6MPI engine was engineered for low-end torque and the six-speed torque converter auto will definitely have lower running costs and higher reliability than DSG although it is less “fun” and less efficient. your opinion – comparing to vios, city and rio engine+gearbox combination, which is the more reliable? less maintenance cost? Obsolete engine? This engine is just same like the NORMAL engine which Vios & City running. Please go study what is TSI & DSG7 before comments. please myvi potential buyer better get this. tired of looking at myvi already. I know VW is sane enough not to sell their cars with 2 airbags. Hicom, wtf are you doing? saw this car at ldp today during rush hour in the rain without plate.. looks a bit ‘ tonggek ‘ than the previous model. or maybe just to my eyes. no matter how many thumbs down this model will get, you will see it plenty otr i tell you..
this car is a step smaller than vios city duo….bt who wd have thought a vw wil be sold at his ‘competitve’ price? wel done i must say…u buy this car the image and probably the reliabilty , it never sold for design or flair…. bt i honestly think the size is close to saga flx rather than vios/city…. Have u ever sit in Suzuki Swift? Or Mini? Haha… Many Malaysian are still choose in SIZE. 2 airbags? No ESC? Please people, at least buy the sedan version with 4 airbags, though it still lacks the ESC. Ayam disappointed with the safety specs. Ahh well. Looks like DRB-HICOM wants to hold their own. But if enough Msians complain, they will give more safety kit like the Prevé, which has 6 airbags starting this November. Dual Airbags? Are u kidding VW? to solve DSG problem. just give us a manual. Y ppl compare vw and proton? Price wise for proton and quality? Proton resale value? 0.
i have entered the cabin at the KLIMS yesterday, in my opinion, to the very least, it feels fairly premium.. ok la, not that bad esp when compared to the other japanese brand! Having back from Delhi, I see this car plenty on the roads…like mushrooms. c’mon VW ths is Malaysia not India, we wish for better VW cars! Yup! All the while VWM only bring-in high spec VW cars, but this 2 polo 1.6 are really disappointed. What do you think Polo HB 1.6L vs Swift Sport 1.6L too? Serahkan saja kepada Allah. 15 minit lagi azan Maghrib akan berkemundang. Bulan depan saya kena masuk hospital balik, Tak tahu nak kata apa. “korang rase hari ni mak cik dema(dewan makan) masak ape eh? masih tiada seorang cikgu yang jaga,Malam itu, yeke?”aku mempelawa Husrizal kerana aku tahu ibu bapanya tiada di rumah. Medal yang diperolehinya daripada pertandingan bola keranjang peringkat negeri.